BJP leadership told Sena's interlocutors that the party did not consider the Sharad Pawar-led NCP and Raj Thackeray's Maharashtra Navanirman Sena (MNS) as "political untouchables"
The Bharatiya Janata Party (BJP), said sources, used its trump card to get the Shiv Sena to agree to an alliance in Maharashtra. 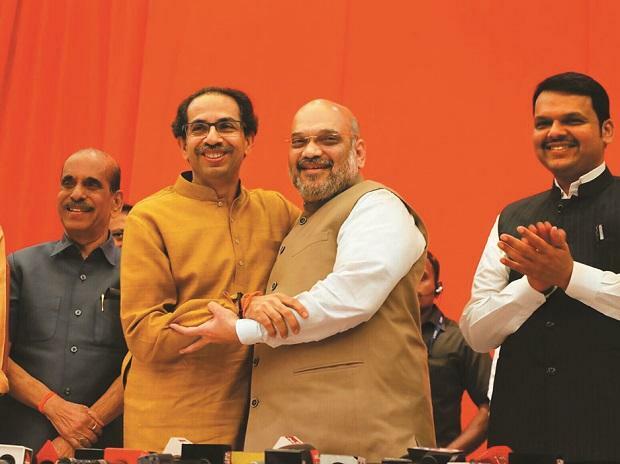 The alliance was announced on Monday after a meeting between BJP President Amit Shah and Shiv Sena Chief Uddhav Thackeray. During the meeting, the BJP leadership told Sena's interlocutors that the party did not consider the Sharad Pawar-led Nationalist Congress Party (NCP) and Raj Thackeray's Maharashtra Navanirman Sena (MNS) as "political untouchables". That was the "trigger" for the Sena to lower its guard on the issue of an alliance. "The fear of NCP and MNS forming an alliance behind the curtain was conveyed successfully to the Shiv Sena leadership," a BJP leader said. The Sena has also been promised more portfolios at the Centre, BJP sources said. Meghalaya Governor Tathagata Roy on Tuesday tweeted, "An appeal from a retired colonel of the Indian Army: Don’t visit Kashmir, don’t go to Amarnath for the next two years. Don’t buy articles from Kashmir emporia or Kashmiri tradesman who come every winter. Boycott everything Kashmiri. I am inclined to agree." Many questioned whether the governor thought Kashmir is not part of India. "People like Tathagata want Kashmir but without Kashmiris... He will be best placed to know he cannot have one without the other so what's it to be?" former Jammu and Kashmir chief minister Omar Abdullah asked on a social media platform. Following the great opening of Gully Boy, the film’s title song Apna time aayega (our time will come) has become an anthem of sorts for the underdog or those in distress. The song has touched a raw nerve among stock market players. Given the continuous slide in stock prices, particularly of smaller companies, many investors and brokers can be heard humming apna time aayega — keeping afloat hopes that the market will soon see a reversal in trend. The Sensex on Tuesday fell for a ninth straight day — its longest losing streak in eight years.